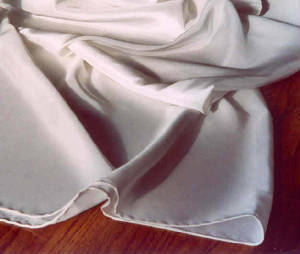 The scarves start as pure white silk, shown right. All scarves are 100% silk, handhemmed and handpainted. Four types of silk are available, each a different weight and texture. Habotai and Flat Crepe are the lightest, airy and silky to the touch. Crepe de Chine is a bit heavier, with a textured, sandwashed feel. 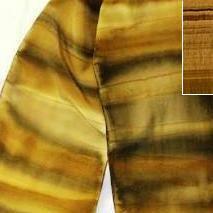 Silk Satin is used for the heaviest scarves, and is very lustrous and silky. To paint a scarf, Susan stretches it like a trampoline on a special adjustable frame with claw hooks - a type of double tipped pin that hold the silk firmly without tearing or distorting it. She paints with Setasilk colors, which flow like watercolors. 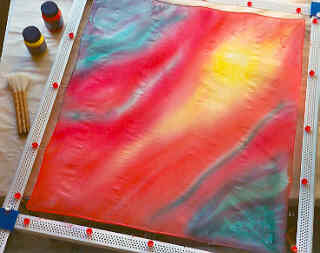 The abstract sunset on the left was painted on wet silk, to let the colors flow smoothly together. 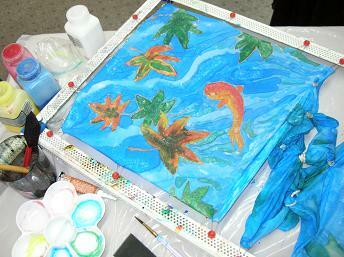 The koi pond below was painted on dry silk, using gutta resist to keep the colors separate. SUSAN SIEBER learned how to paint silk while working in Beloit College's theater costume shop. She was inspired to paint patterns and textures from nature by a performance of Anton Chekov's "The Cherry Orchard". In the play, 20' silk panels painted with abstract tree branches and pink flowers hung from the top of the stage. When the orchard was 'cut down' in the performance, the panels fluttered gracefully to the floor. Her instructor Donna Thorson used raw silk and china silk for many of the period costumes for the plays, and often demonstrated the durability and versatility of silk. 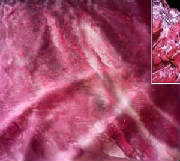 Now, Susan paints the textures and colors of nature on scarves, from stones to leaves to ocean waves.